BARELY two weeks to go before Katherine Espin crowns the next Miss Earth. With pre-pageant activities unfolding day after day, new girls are emerging as forces to reckon with in the competition. With two gold medals under her belt, Miss Puerto Rico Karla Victoria Aponte just sealed her “front-runner” status in the competition. The 19-year-old student is bringing sophistication to the competition. And her red dress during the long gown competition just screams “winner”. 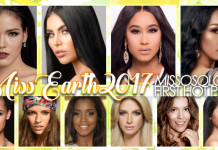 It won’t be a surprise if Karla wins the first Miss Earth crown for the Enchanted Island. Not far behind is Vietnam’s Lê Thị Hà Thu. She is probably the most well-rounded delegate in this batch. She already won three medals so far (one gold and two bronzes), making her an unstoppable force in the competition. With her undeniable charm and popularity, this 25-year-old model and singer will surely bring Miss Earth to greater heights in case she wins it all. Ninoska Vasquez just proved she is not Miss Venezuela for nothing. With back to back medals in swimsuit (silver) and resort wear (gold), this 25-year-old psychologist already cemented her spot as one of the best in the competition. 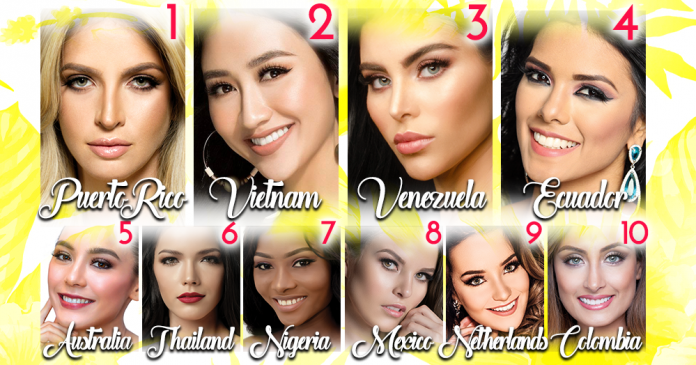 Completing our Top 4 for now is Miss Ecuador Lessie Giler. One of the freshest faces in the batch, this 18-year-old law student is slowly but surely climbing to the top. With a bronze medal and a number of sponsor awards, it won’t be suprising if she duplicates Espin’s win.